WeatherTech Sunroof Wind Deflector - Lightning Motorsports - Selling Speed since 1996 ! Sunroof Wind Deflectors offer a custom fit, functional addition to any vehicle. Let the fresh air in! 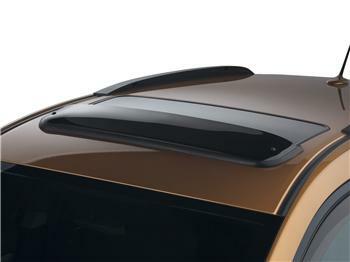 The WeatherTech Sunroof Wind Deflector gives you an excellent reduction of in-cabin wind noise and air turbulence! It is crafted from the finest 4mm thick, tinted cast acrylic. Our sunroof deflector fits the sunroof opening precisely, and is held securely in place with the MagiClip vehicle specific fastening system. To protect your vehicle’s finish, the unique AirCushion gasket seals the edge of the deflector. WeatherTech Sunroof Wind Deflector are guaranteed against defects in materials or workmanship for 3 years from the date of purchase. Exclusions to this warranty are wear due to severe abrasive conditions and chemical contamination, such as spilled gasoline, bleach, etc.